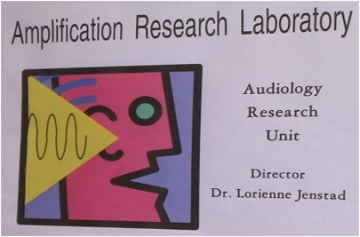 The Amplification Lab was established in 2005 by Dr. Lorienne Jenstad. Her goal was to create an interactive environment for students and researchers to study the effects of amplification, particularly for older adults. The lab is fully equipped with clinical audiological equipment, including an audiometer, hearing aid test system, NOAH, and otoscopes. Research equipment includes a KEMAR, a TDT system, a Hammerfall soundcard, and a Larson-Davis sound level meter. The lab is housed within the Audiology Research Unit and shares a common space with two other research labs.